What does extraordinary living look like? From the enchanted seaside landscapes of France’s southwest coast, to the sweeping bay views of Miami Beach, the Coldwell Banker Global Luxury® program has rounded up 10 of the most extraordinary homes that recently hit the market. If nothing else, these inspiring properties prove that the picture of “extraordinary” can take on multiple forms. 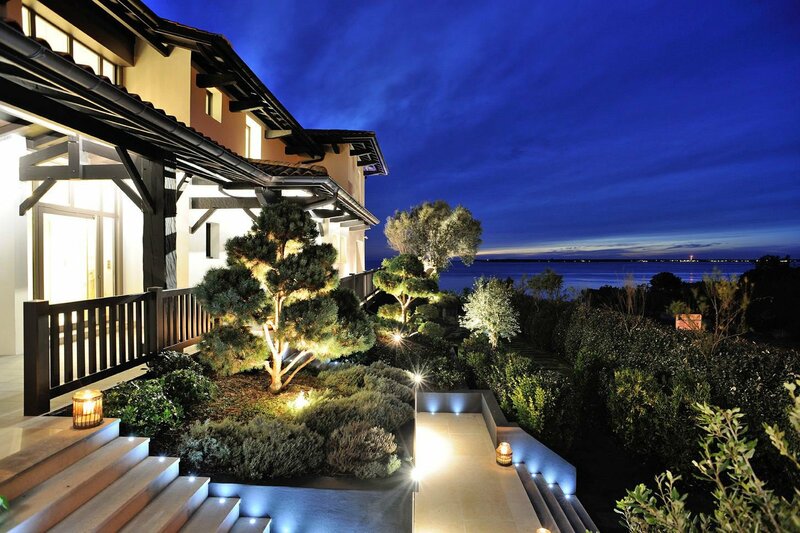 Resting in one of the most remarkable settings in France’s Arcachon Bay, this exceptional and unique 7,000 square-foot property captivates with a pool and mesmerizing sea view with direct access to the beach, Pyla Sur Mer. The estate consists of a main house, a guest house and a concierge house. A sense of lightness and modernity characterize the large living space, which includes eight bedrooms and seven bathrooms. 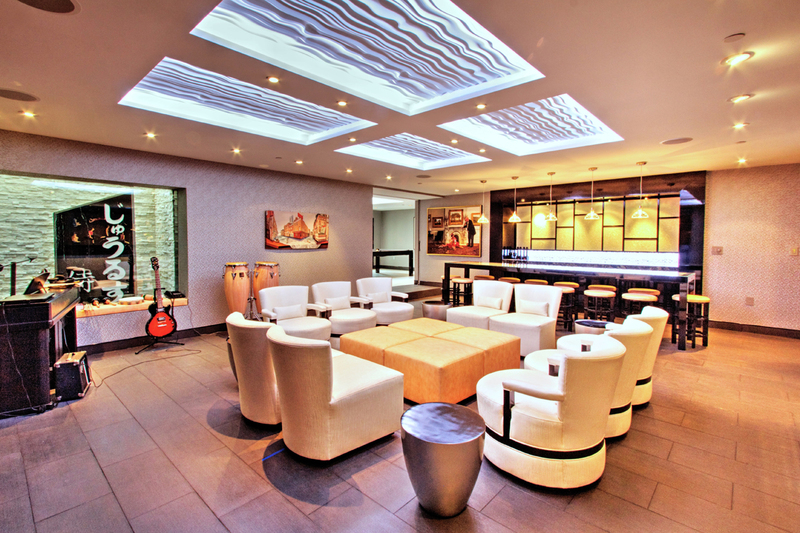 Every detail has been designed to offer high-end services and an exceptional comfort level. From the Glazed wine cellar and sliding bay windows to reversible air conditioning, the luxury amenities offered by this property are numerous. 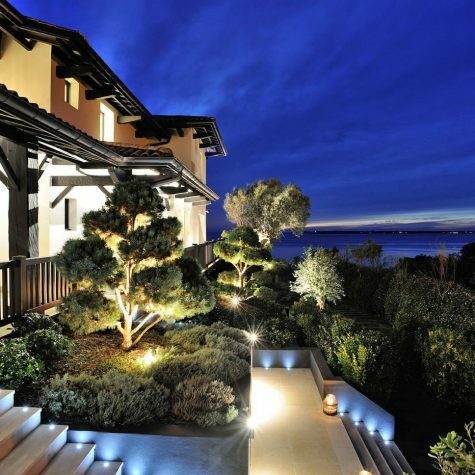 Enjoy beautiful sunsets in this truly one-of-a-kind house, with its incredible views and highly detailed design. 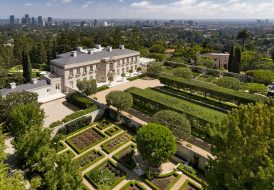 Mille Fleures is an extraordinary and romantic estate set on nearly two prime acres in Holmby Hills. Exquisite iron gates open to a long private drive leading to the grand French Manor residence, designed in 1925 by architect Sumner Hunt and recently restored by designer Thomas Beeton. Stunning architectural details abound, from a large entry hall with coffered ceiling to an elegant living room with imposing stone fireplace and a palatial dining room leading to garden terraces and glass-enclosed conservatory with outdoor living room and fireplace. A luxurious family room/screening room with fireplace and beam ceiling, private office and chef’s kitchen complete the first floor. A gracious second level with four en-suite bedrooms, including a lavish master wing with sitting area and elegant double baths, offer the ultimate in privacy. The sprawling grounds include magical pathways, towering trees, specimen gardens, original greenhouse, two guest cottages, a two-story pool pavilion with fireplace a spectacular lap pool, garage parking for five cars, additional parking for 20, a separate gym and room for tennis court. Enjoy the soaring views from this gorgeous new Aspen contemporary, private estate featuring six bedrooms with en suite bathrooms in the main house and a one bedroom, one bathroom guest house. 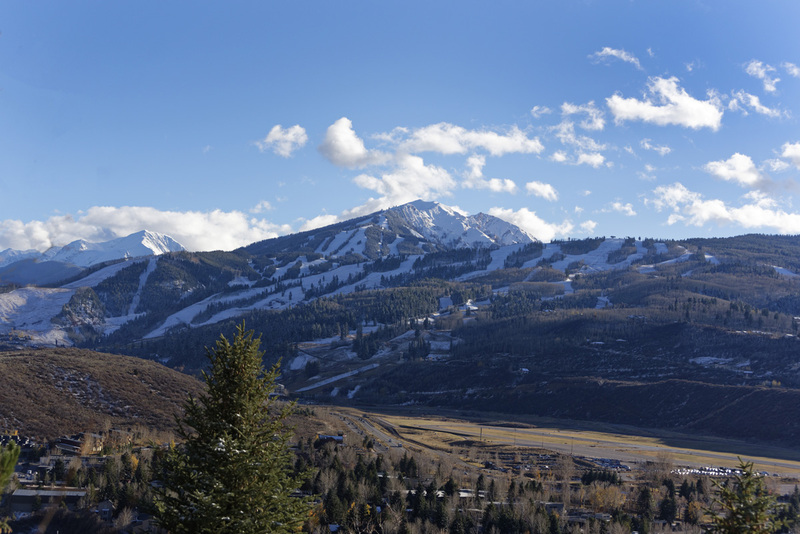 The residence puts Aspen’s natural mountain beauty on full display, as it rests on over four acres of land with outbuilding and large fenced pasture. Outdoor patios flow onto a flat manicured lawn encompassed by huge spruce trees. Floor to ceiling windows provide sprawling views and an abundance of natural light throughout. 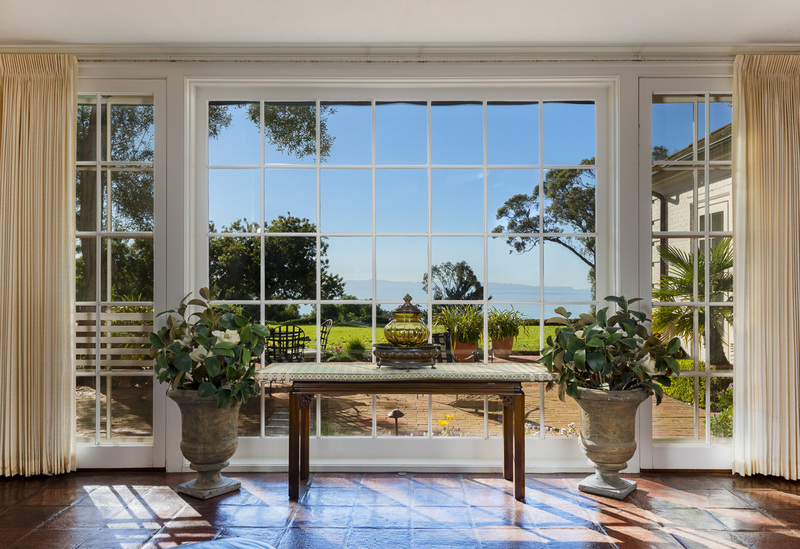 Panoramic ocean, island, mountain and sunset views can be enjoyed from this captivating Hope Ranch estate. Encompassing two parcels for a total of approximately 5.5 acres, the property includes a main residence boasting six bedrooms, five and a half baths, formal and informal living areas. A gracious country-style kitchen is where everyone will gather for food and conversation. A separate guest house/office with half bath (above the detached garage) makes it ideal for visitors wishing for privacy or for creatives longing for quiet inspiration. Garages for 6 cars, plus guest parking in the circular motor court and a gated driveway around out the many amenities found on this property. The grounds have a magical quality, made possible by avocado orchard and fruit trees, horse pastures, mature landscaping with rolling lawns and a lighted tennis court. Grab your binoculars and watch the whales migrate in the channel. This contemporary Oceanside corner unit sits at the coveted tip of Fisher Island with unobstructed sunrise views to Government Cut, ocean, beach and Miami Beach. The five-bedroom unit boasts 6,820 square feet of interior space with beautiful Travertine marble floors, an open dining and living room layout with a fireplace and walls of glass that open to endless ocean views. The gourmet kitchen features top-of-the-line appliances and a separate breakfast area. The large family/media room is ideal for relaxing and entertaining. The master suite is amazing with direct ocean views, separate his and her master baths, each with voluminous walk-in closets. The other four bedrooms each come with their own ensuite baths. Watch the parade of cruise ships from your expansive wraparound terrace with multiple seating areas to relax and enjoy the ocean views. Replete with craftsmanship of another era, this extraordinary tri-level gated French traditional estate illustrates elegance in every aspect. Custom-built by its owner and completed in 2008, the home is located on a coveted Central Flats’ block moments from Beverly Hills’ famed “Golden Triangle.” The interiors are characterized by sunlit spaces with super high ceilings, French doors, wood and marble floors, plus mouldings. A convenient elevator accesses all three floors. A dramatic two-story skylit entry with sweeping stairwell greets you as you are welcomed into gracious living dining and family rooms. A separate library/office offers additional private space. Upstairs, there are four bedroom suites, including a sumptuous master with sitting area, balcony, fireplace, dual baths/walk-ins. Two suites on the lower level, along with a professional screening room, wine cellar and game room round out the amenities. The private grounds beckon with lawns, pool, spa, BBQ center, patios and mature hedging. A four-car subterranean direct-entry garage for privacy and security in addition to tremendous off-street gated parking. Completely remodeled in 2018 with the highest quality finishes throughout, this contemporary masterpiece has explosive city-to-ocean views from every room in the house. Located on a quiet street in the prestigious Bird Streets, this house was built for entertaining. High ceilings, open floor plan, expansive living room, built-in bar and walls of glass lead to a remarkable outdoor deck with resort-style pool and spa. The crown jewel of this home is the master suite, with its private patio, fireplace, huge walk-in closet, separate lounge with bar, Zen garden and sumptuous bath all work together to make this a very a special and personal area. Enjoy the large formal dining room and chef’s kitchen with a full line of Miele appliances. 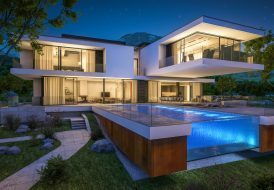 Three guest bedrooms, plus a lower level media room, wine room and professionally designed gym complete this sleek Los Angeles abode. This is a once-in-a-lifetime opportunity to own one of the most magnificent trophy properties in the U.S.: The Victory Mansion. This Gibsonton waterfront mansion with adjacent lot totals nearly 160 acres on the water. It is the perfect island retreat to get away from it all. 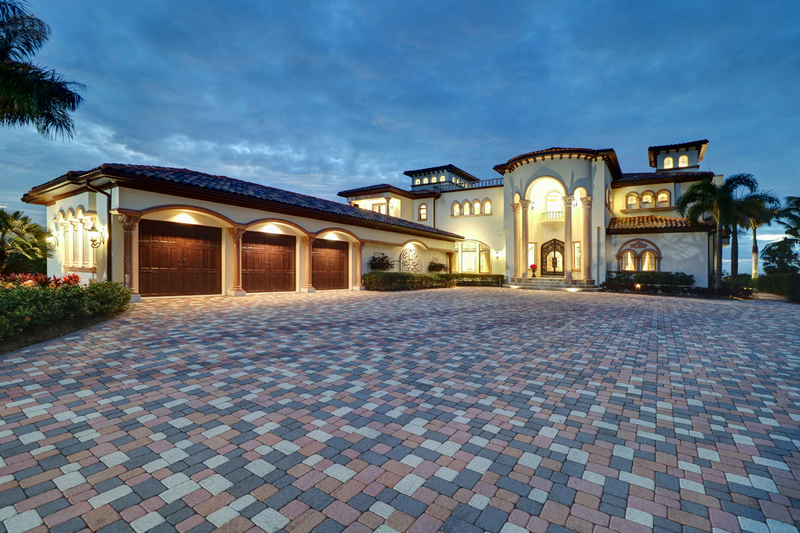 A gated entry and tree-lined driveway will lead you to the Victory estate showcasing classic and modern design with coveted wide-open views of Tampa Bay. Enjoy direct gulf access with unobstructed sunset views. You will be delighted with the large rooms that the home has to offer with sweeping bay views. Craftsmanship is unparalleled with custom designed intricate ceilings including hand-applied gold leaf, marble floors with inlay, world-class custom chandeliers, solid wood cabinetry, Onyx master bathroom, custom designed trey ceilings with lighting, dual fireplace and covered outdoor terrace. Enjoy entertaining with a complete gourmet chef’s kitchen, butler pantry, movie theater, over-sized garage and guest will love the en-suite bed and baths. The enviable outdoor space is highlighted by the gorgeous infinity pool area with spa, basketball court, tennis court, additional separate garage and storage, inside gym with pool bath, covered grill area, boat dock with lift, private beach area and a rooftop deck with unobstructed views of downtown Tampa and St. Petersburg. Features such as block construction and hurricane impact windows and doors will give the future buyer further peace of mind. Nestled in between Liguria and Tuscany, in the shelter of the Apuan Alps and at the mouth of the famous Gulf of poets, a unique property called the “Villa of the Angel” resides. The villa captivates with a fascinating history and unique architectural features. 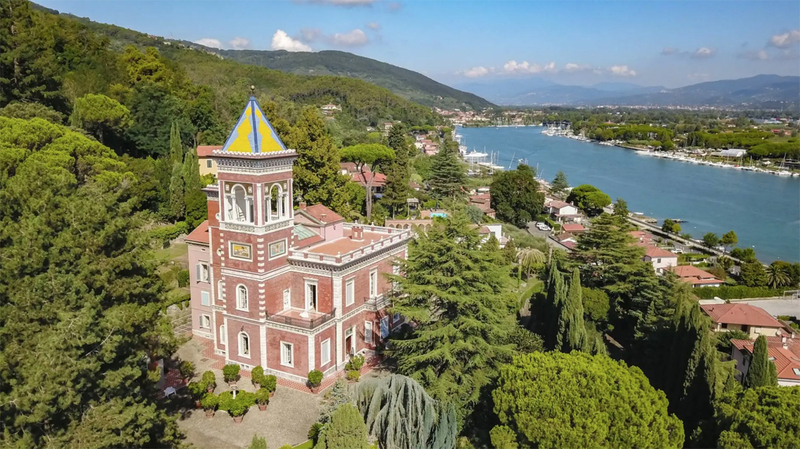 The property is situated in a beautiful park of 17,500 square meters overlooking the mouth of the Magra river and the marble quarries in the village of Bocca di Magra, a tourist destination of interest due to its proximity to the Cinque Terre and for the convenience of the port. 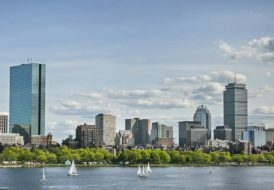 It was built at the end of ‘800, commissioned a British architect from Bernardo Fabbricotti, a descendant of one of the most powerful families of Italy who dominated the world market between 800 and 900. Through the long driveway, the estate breaks into a large private park of approximately two hectares, consisting of portions for woods and olive groves, rich in trees with low, medium and tall trees with evergreen bushes and other lush foliage. A natural forest of pine trees leads up the hill to the Art Nouveau villa. Placed at a diagonal position at the entrance to the village, the villa is visible at a distance from the slender tower soaring with tall columns of white marble. The residence is an homage to the neo-Romanesque and Renaissance style, as seen through the pictorial panels and the tower in ornamental friezes of bands. All around, a large white marble balustrade dividing the domestic area underlying terraces, a landing with double ramp ladder leads to the lower level of the garden and cellars. Currently, the villa is divided into two units, connected by the main staircase in marble. The first unit is characterized by a circular staircase in the prestigious rose marble that combines all levels. A local cellar, various storage accessories, kitchen with dining area, three different seating areas, four bedrooms and related services and local closets are found here. On the fifth floor, you enter the tower with a splendid loggia with trefoil openings with arched central light on three sides consisting of columns, capitals and white marble entablatures. The second drive is connected by a rectangular wooden staircase. Here, there is a cellar, basement and laundry, as well as kitchen, large living room, dining room, living room with large terrace, four rooms, local study and sitting room with skylight. On the fourth floor, there is a large terrace with panoramic views over the mouth of the Magra. The interior finishes of prestige were made using materials such as rare marbles availability, parquet, plasterwork, silk upholstery. Villa of the Angel offers an extraordinary setting surrounded by frescoes, marble columns, ancient sculptures and artwork, as well as unique furnishings. 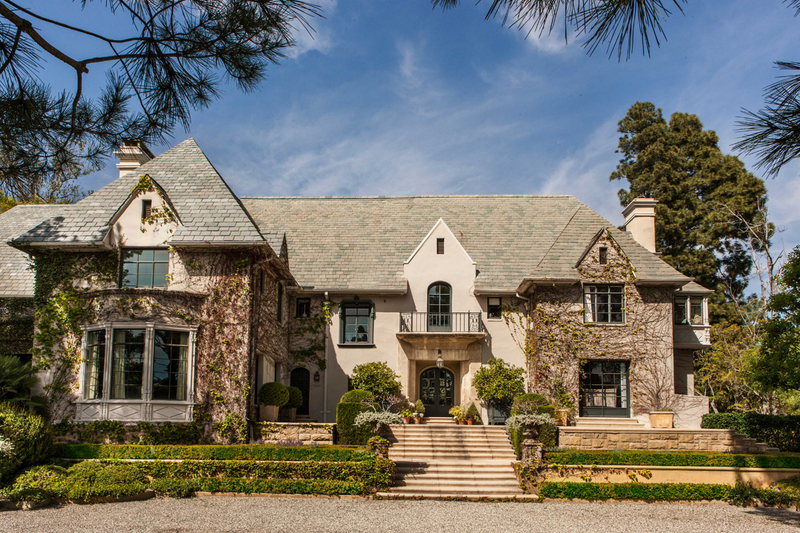 “Simply the finest estate in guard gated Mulholland Estates,” according to the listing description. This custom-built modern home has everything a discerning buyer would need. Since the residence is discreetly gated from the street, you would never know that 16,000 square feet of luxury exists just beyond its gates. This site was chosen by the owner when this home was built because of the privacy, rare 1.67 acres of flat land and the gorgeous views. The spacious entry invites you inside, where a large open living room double staircase, formal dining room, amazing culinary sous chef kitchen and large family room await. There is also a two-bedroom staff suite on the main floor. Upstairs, a master suite presents an oasis with luxurious master baths and closets, plus huge windows overlooking the stunning views. The “entertainment floor” has a huge professional theater, game room, satellite kitchen, three large offices, wine room and a 10-car garage.